Aura explores the use of wearable technologies to enhance privacy and affection, and enable tangible communication between expecting parents. Being my MA thesis, I was responsible for every aspect of the project: from research and ideation, to skill gathering, prototyping, testing, and final delivery. Two semi-functional physical prototypes — a dress and a wristband — that enabled conversations about affection and privacy between expecting couples. An embodied questioning of the gaze on the pregnant body, these make-believe objects invite us to reflect on the use of emerging technology for its poetic value. Exploring new meanings for emerging technologies that enhance our humanity. From a speculative perspective, the project aims to use design as a critical tool for a debate on the narratives of physicality. Primary users of the wearable devices are expectant mothers from the 25th week of pregnancy and their partners. Aura aims to let users explore different ways of communication and connection. The project explores the human aspect of distance — both in its physical and emotional dimensions — within an expecting couple. The project also sought and considered input from diverse stakeholders such as: fashion and clothing industry leads; online and retail clothing stores; physicians, ob-gyn, midwives and antenatal class instructors; and expectant parents’ relatives and friends. Much of the inspiration for the project was drawn by the narratives, participatory interviews and cultural probes of expectant couples from Spain, Italy, and South Africa — framed by sociological studies on surveillance, liminality, and comparative ethnography of the pregnant body. The pregnant body, solely by its presence, is a representation of an intimate status. The pregnant body is liminal, and brings to light three distinctive kinds of relationships: with the partner (one to one), with the woman’s inner circle (one to few), and with strangers (one to many). There is a lack of possibilities for physical and bodily communication between partners (one to one). The gaze of embarrassing “audiences” — like over-attentive colleagues, family gathering, or walk-by strangers — generates an uncomfortable “spectacle effect” in the mother-to-be. Aura is driven by a poetic attitude to provide an experience that is intriguing, mysterious and delightful. As such, the final design is archetypal — black and white, basic shapes, and common materials — and uses physical interactions to foster imagination and curiosity. The dress provides comfort during pregnancy: two stretchable elements support the woman: just below the breast, and below the lower abdomen. The partner’s wristband shares its archetypal approach with the dress: made of white silicon rubber, it integrates two micro vibration motors, one of which works as the closing mechanism. 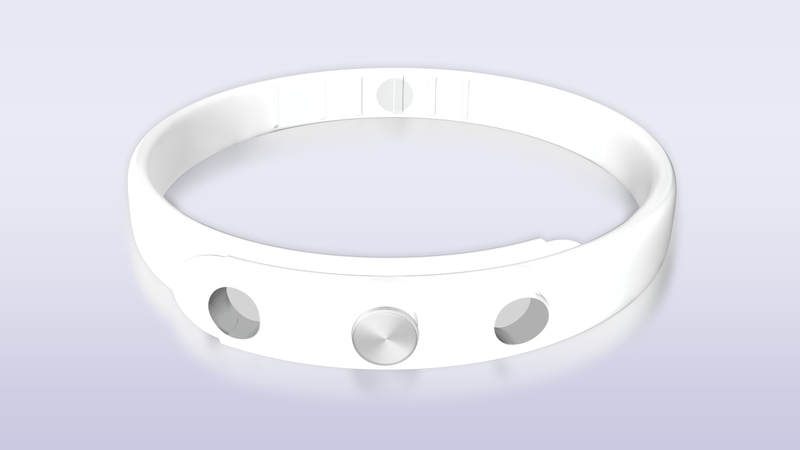 A temperature sensor — not implemented in the prototype — activates the bracelet only when it is worn, and a force sensor is used to sense the responsive touch of the partner. Aura stands in a liminal space between private and public communication. The interactions — between expecting parents, and with their own devices — generate private codes from a public sign, the pregnant body; they are participatory and delicate: the couple enters a wordless conversation, based on presence and touch. A step-by-step video of the interactions. 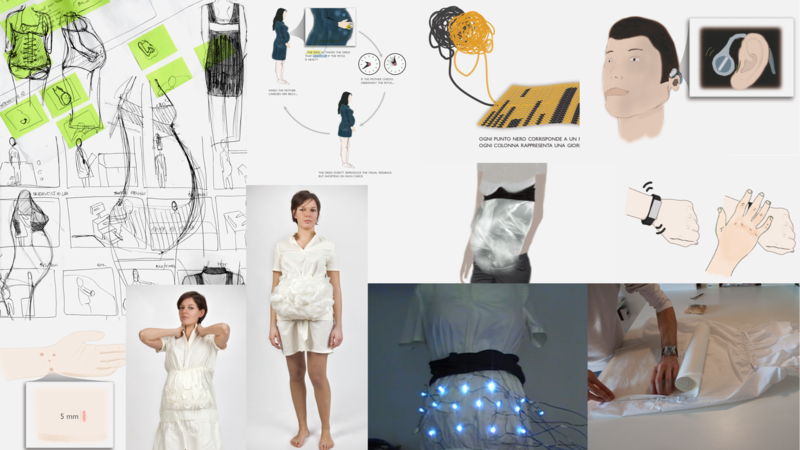 Aura is being embodied in two functioning experience prototypes: the dress prototype — seen in the images above — integrates custom textile force sensors to capture the mother stroking her belly. A set of 16 LEDs were integrated into the silk display, and their behavior was controlled by an Arduino board, two CD4051 multiplexers, and one TLC5940 led driver. 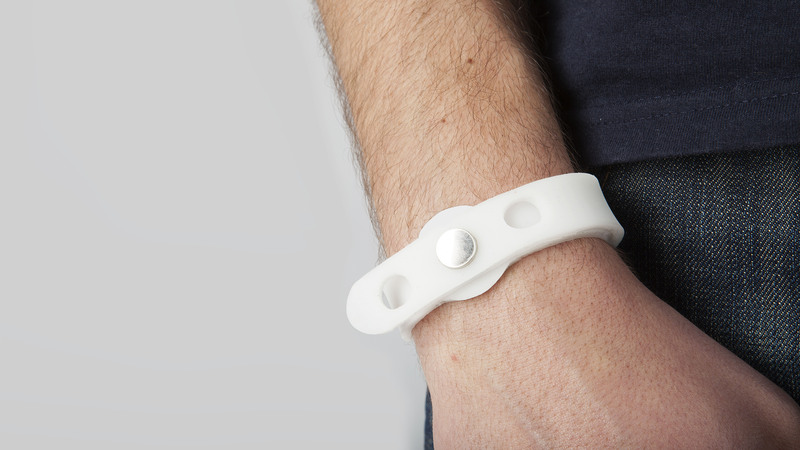 The bracelet was created with a silicon rubber cast and featured two vibration motors: one embedded, and the other as the wristband lock element. Here’s the Arduino code that controls both prototypes. Constant feedback and critique helped inform the design process from concept to final prototypes. Potential users, healthcare professionals, fellow design students, and tutors Gillian Crampton Smith and Philip Tabor were involved throughout the process. To know more about the process, have a look at my dissertation, or contact me. The final prototypes were tested with Mamiu — an association providing antenatal classes in Padova (Italy). Here are some quotes from the participants.